All of the guys in Andrew's wedding were long time friends and softball buddies. 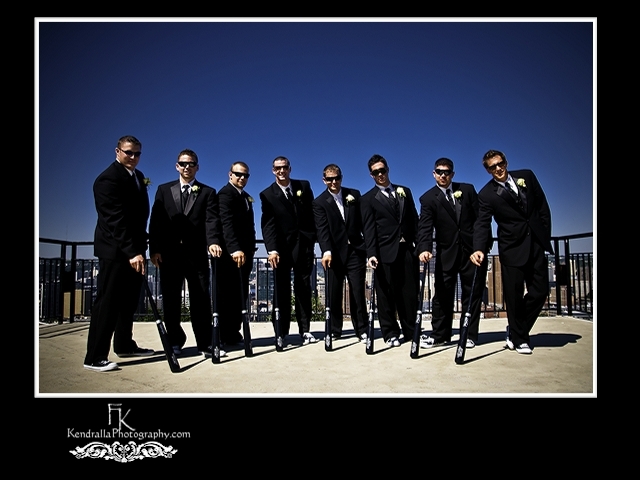 Therefore, the gift from the groom (Andrew) to the guys was a softball bat with their names engraved in it. A very nice gift and touch. Something they can keep for years and look back on with a smile. We were on one of the observatory decks of Mt. Washington, overlooking the beautiful city of Pittsburgh. It was mid day and the sun was hot (100 degrees +-). However, the groomsmen, best men, and groom, were all very cooperative and we were able to create this fun shot with a beautiful blue sky in the background. Next up were the ladies. 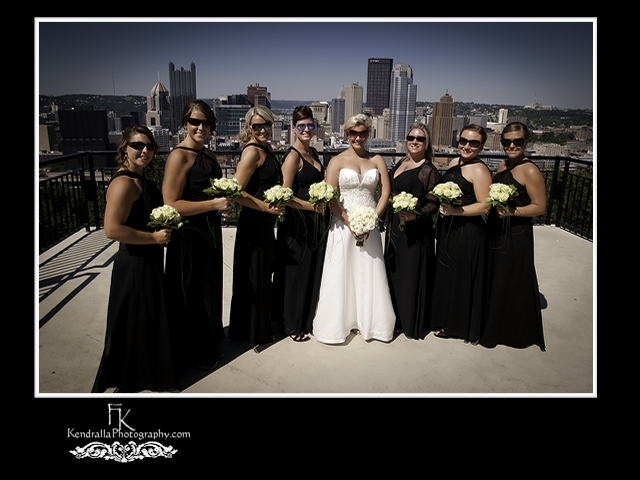 We wanted to add to their beauty with a landscape shot of Pittsburgh as a backdrop. The sunglasses helped to cut down on the strong sun glare (and no doubt glare from my head). The third image is an entire group shot of the ladies and guys. Again, we utilized sunglasses to reduce the strong glare from the sun and create a fun look for the group shot with the city of Pittsburgh as a backdrop. The wedding was held in Munhall, PA (images from the beautiful church will be posted in future posts) and we stopped on Mt. Washington for wedding pictures before heading to the Double Tree hotel in Moon Twp. PA.